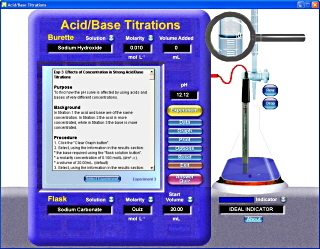 The software will allow your students to perform virtual titrations in minutes. 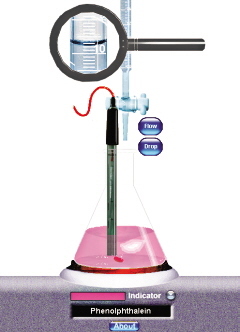 Students can alter the type of solution in both the burette and the flask, as well as the molarity of the solutions and the volume in the flask. Seven indicators may be used including Methyl Orange, Litmus and Phenolphthalein and may be changed at any stage of the titration. 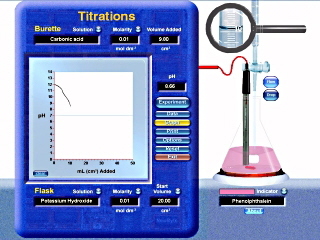 The quiz option allow students to test themselves by performing titrations on a solution of unknown strength that has been generated by the computer. There are 5 preset experiments to enable students to get started quickly. Blackline masters include 12 more experiments.